Perfume saleslady Melody Parris feels like her life is in neutral. Her stick-in-the mud boyfriend won’t commit and she gets passed over for a promotion at the store where she works. She decides to make a Christmas list. After it’s deposited in Santa’s mailbox at the store, she starts getting everything she wanted, but it doesn’t always turn out as she expected. The Christmas List is one of the most requested movies each season, however it has not aired on TV since 2012. As far as we know, Disney/Buena Vista owns the rights to this movie. We encourage everyone to contact them directly. Perhaps if enough of us do, they will consider releasing it on DVD or at least airing it on one of their many networks. This movie normally airs throughout the holiday season on the Freeform (formerly ABC Family). For a complete schedule of dates and times, please click here. I really love this movie. Wish it would be aired on tv again during the Christmas 🎄 holiday season. not one any more…only can buy without CC on it. i want a factory copy. disney bought the right somehow to this movie. I love this movie. They need to bring it back for Christmas! I wish I could purchase this on DVD. You can watch it on YouTube and this is the version people are putting on DVD and selling. Not great quality but watchable. since Disney now owns the rights to this movie, it is time or them to make money off the dvd, by selling them. everyone is asking for this movie to made into a dvd. the dvd needs to have closed caption on it. I really wish they would put this movie on t.v. at Christmas time. I love to watch it. It is a feel good movie. I love The Christmas List and look for it every year. They need to bring it back to TV and sell the DVD. I literally love this movie! My favorite part is the creme brulee scene! I look for it every year but to no avail and miss it terribly. I was also tricked by Hallmark when they used the movie title for one of their new movies. Please bring this movie back to TV or put it out on DVD! I will purchase! I want to see “The Christmas List (1997)” movie in full so badly. It is one of my to fav xmas movies of all time. What I really wish for is to have it on DVD. Everyone who wants to see Mimi Rogers “The Christmas List”, go to Freeform’s 25 Days of Christmas webpage and scroll down to “contact” and send them a comment saying YOU WANT TO SEE IT! It’s too late for this year, but if we ALL tell them to bring it back, maybe they will air it next year. Please air “Christmas List” with Mimi Rogers! My daughters loved it, and we’ve been looking for it ever since it first came out!!! Many people would love to see this Christmas gem again. What is the problem? What would it take to convince the company that owns The Christmas List to air it. This is a wonderful movie and I looked forward to it each year. The Christmas List is a wonderful Christmas movie with Mimi Rogers, however, you continue to not air it. Please air it this Christmas! Please show this one during the Christmas season. One of my favorites!! This is my favorite Christmas movie!! Please release it on your network and/or DVD. I found it on DVD in EBAY. The Ebay DVD is a bootleg pirated copy of a recording off Family channel. It doesn’t have the deleted scenes, the quality is poor. WHERE CAN WE GET IT ACROSS TO THE POWERS THAT HOLD ON TO THIS – THAT IS WAS AND IS A GREAT MOVIE. PLEASE, PLEASE, PLEASE – RELEASE IT AGAIN AND SHOW IT!!!! or tell us – if you can – who is keeping it from being run again!!!!!!!!!!????? Hi Pat, so many others agree with you! As far as we know, ABC/Disney (the movie originally aired on The Family Channel – later ABC Family, now known as Freeform) still owns exclusive rights to air it. They simply choose not to. We updated the YouTube link above to show the full movie. This link is not the full uncut movie. The original was so much better without all of the cuts taking it down to 1 hour and 26 minutes. I would pay anything to have that version myself! The youtube video was removed by youtube due to it being a pirated copy off the air. It would seem that whomever owns the rites to this movie would see the many replies to the fact that we want to see this movie again. It is one of the nicest Christmas movies that was made for TV and I urge the powers that be to show this movie again this season, 2017. I am 75 yrs. old and I just yearn for the Xmas movies to come on at this time of year. I am in a wheelchair and have many abnormalities and would hope and pray that these comments fall on the ears that matter in TV land. Please show this movie this year. Thank you. Really hate when they use a title from a movie for a current movie. I was so excited to see it and it was a wrong movie! I looked it up on YouTube but they don’t play it now for some reason. You have to find some other site. As Tom Selleck said in Three men and a little Lady…what a crock! This movie was and is very popular. I don’t know why some corporations think change for the sake of change and seemingly easy quick profits are always a good thing. We watched a little of the new Christmas List that Hallmark put out and it stinks by comparison. The original ranks up there with silver bells as one of their best. Why fix something when its not broken? Hello my thoughts exactly I am searching for Christmas list on Google. Then you was the frist person. Who talk about how they feel about this movie. Your post was 2016. Hallmark is playing Christmas movies . 10/30 /17. I really miss this movie. Extremely disappointed!! Advertised the wrong movie all week long and then aired a new movie with a similar name. As you can read, many loyal fans were also disappointed. Please play The Christmas List with Mimi Rogers this holiday season so we can save it with our DVR’s. I agree. I was so very upset this week. I was so happy to see it was being aired and then to have a new movie with similar title come on. I watched the new movie anyway and it was awful. We go through this every year, and I have been sending emails to Disney about this movie yearly for 15 years. It is not going to change their minds and they do not give a $%^& about what we think. Venting here makes me and others feel like we are giving them feedback, but no one at that company is reading these comments. This year, I give up. They DO NOT CARE, and will never release this movie on DVD. I will be very surprised if it is ever shown on TV again either. No it isn’t. It is a different movie with the same name. Read a bit further and you will see other responses to this as well. Hallmark really screwed up. The movie called “The Christmas List” showing to night is a different movie. This is a real bait & switch. Shame on Hallmark – not up to their usual standards. It is not on…very unhappy!! It is not on right now..even though it has been advertised all week..I am very angry..I look forward to this movie every year….Very unhappy!! No it’s not. I got excited and turned it on because that’s what it says should be playing, but it’s the stupid new one from this year yet again! I’ve had ENOUGH of television and so called customer service, etc. So it said, but it was the newer movie with a different plot. Broke my heart! I fell for it too! Hallmark Channel said it was the 1997 version of The Christmas List for Nov. 30 @ 6pm and what a disappointment when they really were showing the new version. Why can’t they include the original with Mimi Rogers too???? Yes we were tricked also. Good going HALLMARK. Such a disappointment to find that we pay so much for TV service and can’t get the ones we like and have liked for many years. My family loved watching this movie! Please show it in 2016! I LOVE THIS SHOW! I am not sure when so many love it they cannot make it available. It is one of the best shows shows ever. Sorry, but the eBay offer is for a bootleg copy recorded off the Family Channel from years ago. It is illegal to sell these, but they do it anyway. Why are you promoting this? The Disney channel should release a clean copy, with all the original scenes restored. It was a tradition for my daughter and me to watch this as well. We look at the listings every year now to no avail. C’mon bring it back!! Check the Hallmark Channel. From what I can tell there’s a new movie called the Christmas list but they also might be showing the old one as well on 11/30. The new movie on Hallmark called “Christmas List” is NOT the same movie as the 1997 “The Christmas List” with Mimi Rogers. NOT THE SAME MOVIE – AT ALL!!!!! Th ends Christmas List movies is terrible on Hallmark. Wish they would any original one. 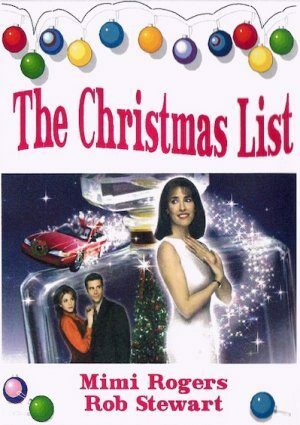 The Christmas List, with Mimi Rogers, is airing Wed. 11/30 @6p.m. on the Hallmark Channel. Fingers crossed this is correct. Our TV guide shows it is indeed the 1997 “The Christmas List” being aired, but Hallmark’s website shows it is “Christmas List” with Alicia Witt and Gabriel Hogan. It is NOT the Mimi Rogers movie. Hallmark doesn’t own the rights to it, Disney does. Hopefully this year they will air this movie “The Christmas List”. One of many movies to watch on my must watch list of Christmas movies.. Please air The Christmas List! Please show “the Christmas list” this year and make available on DVD. This is a family favorite!!!!! Please show the Christmas List this year it’s a family favorite!!! Please show The Christmas List soon, such a great season favorite!!! Its a shame you stopped showing this movie. It was an annual tradition for me. I watched it no matter what time it was aired and would even take a day off work to watch it! Please play at least once a year..pretty please. I really love this move. My Mother and I always watched this movie every year since 1997. Now my Mother has been gone for six years, and I miss this move as much as I miss her. I wish they would show this movie again. If it can be posted on the internet for streaming, it could be released on DVD. The ones you can buy on eBay and elsewhere are illegal bootleg copies with poor quality video, and may not have the deleted scenes restored. The only way to get a good copy of the entire original is for the owner of the rights to release it. I too have begged in emails for years for this movie to be shown again. Since Disney owns ABC Family, they can certainly show it if they choose. Who oh why do you not show this movie every year? I’m so sick.of seeing the same Christmas movies 5 times in one week and 50 times in a month. If you don’t want to show it, at least put it on DVD so we can buy it and watch it! I would like to report I just received my copy of the Christmas List from RAREDVDS.BIZ And even though it was a transfer from the Family Channel. it’s a Great Copy!! EBAY Maybe selling it but it comes from the United Kingdom. and the cost is nearly $30.00 I paid a little over $13.00 and its shipped from California. I ordered it on 11/26/15. and received it on 12/1/15. This is the way to go if you really want this movie. you wont find it on T.V. Or in the stores. Since Walt Disney owns the rights to it.. it arrived in a sleeve. and there are no commercials. even though it was transferred from the family channel.. I give this 5 Stars. I am very PLEASED with my PURCHASE.. Your video says Private. Why isn’t this movie on TV this week? Just like many of you out there I adore the Christmas list. I had it recorded on my DVR. But erased it thinking I could find this movie on DVD. How disappointed I was when I found out its nearly impossible!! I wasn’t giving up. the closest I came to was RareDVDS.Biz it’s a transfer of the movie. They do have a clip and it was pretty clear. I will post again after receiving it and let you know how it goes.. HAPPY THANKSGIVING!! The Christmas List is for sale NOW on EBAY!!!! It is not a legal copy for sale on eBay, it is pirated off air, recorded and then sold. Why are you promoting the illegal sale? The quality will be poor! We are trying to get a LEGAL, CRISP, CLEAN copy of the movie with all the scenes intact! Don’t promote the illegal sale of pirated merchandise. You can buy The Christmas List on EBAY. Why do they put the same movies on repeatedly in the same year and ignore this awesome movie??!!!! BRING IT BACK!!!!! Its almost christmas 2015 and again we beg to see The Christmas List, and again our pleas are ignored. And now it’s almost Christmas 2017 and they still won’t show it in TV or sell a DVD except for a transferred pirated copy. What is the matter with ABC/Disney that they won’t release this wonderful movie. I put my name out on Amazon to have them send a request but never got a response. I would love a copy of Christmas list also if abc family is not going to show it any more. I agree with everyone…..I love The Christmas List with Mimi Rogers. I look forward to watching it every year and have been disappointed that it hasn’t been on the last couple of years. Why did you stop airing it? Why is it not available on DVD, when it’s obvious that many people would buy it? Here’s to hoping it will get much-deserved air time in the 2015 holiday season. Please don’t disappoint me this year. The Christmas List was a family favorite!! My mother and I used to watch it with my Grandmother every year before she passed away! Now, mom and I try to still watch it together in memory of her. However, we can’t seem to find it on! PLEASE someone play The Christmas List!!!! It’s for sale on EBAY! I too LOVE The Christmas List and don’t understand why it isn’t aired. Someone told me it is supposed to be on at 5 or 6 a.m. on Dec. 23rd this year, but I haven’t been able to verify that. Hope it is true! Hoping for DVD at some point as well! PLEASE show Christmas List this year! Even if it has to be at an off-time. It is a favorite!! Same here! Please play this movie. It’s not too late for this 2014 season. There are so many who really miss seeing it. Please! i agree with Everyone! And what really bits is that I had this movie saved to my FAVoRITES folder on YouTube. But now YouTube took it off…its marked as PRIVATE VIDEO on a gray screen. I came across an old video tape I made of this movie a loooong time ago but I’ll have to find our old Video player first! I’d be pleased if this movie came out on a DVD or better yet, restore it and put it out on blu-ray. I’d pay $20 for a blu-ray version! I agree with MG. They repeat all kinds of holiday movies and they haven’t played “The Christmas List” once this year yet. Please play this movie it’s one of my mom and I favorite and she’s so disappointed that it hasn’t been played. She’s 70 years old and loves this movie so much. So could you give her a Very Merry Christmas for her and me. It’s not the same for my family to not be able to watch this great movie. It is Christmas tradition for us. Please play it this year. One of my absolute favorite Christmas movies. I look forward to it every year. Wish it was in dvd because they rarely give it now. They use to have it on youtube but its no longer there. Needs to be on dvd like three days, picking up and dropping off. So glad I’m not the only one who feels this way. Can’t believe they are not going to show it AGAIN this year AND that you still can’t buy a clean copy on DVD. Buying a bootleg makes me a little nervous. Is it still available to view on UTube? I did a search yesterday but couldn’t find it. Although they did have The Man in the Santa Clause Suit with Fred Astaire, which I also recommend. You must have a different cable provider than I do, because I literally did a universal search for it every day in order to record it, but it never came on. I’ve been doing the same this year, and so far, nothing. But they’ll put some other Christmas movies on that few people want to watch anymore. Like, how many times are they going to put that 30-year-old John Denver Christmas movie on? I can understand putting old CLASSICS on, but enough with some of those old movies that don’t come close to being classics. And most of the new ones are even worse. Just rehashes of other movies. At least the Christmas List is a whole different story! I am pissed that this movie isn’t the one that is actually playing on Hallmark tonight! I got so excited just to be let down when I tuned in and set record!!!!! What a let down and a rip off! The above link works. The poll is to the left of the list that airing list. Why can’t this movie be shown or sold on dvd? This is my mom’s (87) and my favorite Christmas movie! If you want to ABC Family play The Christmas List this year, please go to this page and vote in their poll! Thanks! I clicked on the link, but all I see is a list of the movies (saaaame old stuff) that ABC Family is airing – no poll. And, of course, once again, the Christmas List AINT on it. EXTREMELY DISAPPOINTING. I am totally in the dark about why they refuse to air it. PLEASE show The Christmas List with Mimi Rogers in the 2014 Christmas lineup!! It didn’t air last year and I’d really love to see it this year. Thank you! Well, yet again Family Channel is NOT showing the Christmas List and they haven’t aired it in years. Why don’t they release it back to Lifetime Channel (or however that works) because at least when Lifetime owned the rights to it, they actually SHOWED it. I don’t know what Family Channel’s problem is, but if they don’t want to air it, give it to someone who does or release it on DVD. What is the problem? With all the technology these days, I just don’t understand why it is not available on DVD and I don’t understand why Family Channel refuses to air it, again this year. Disappointed again! You can NOT buy this on ebay or amazon. Please make this available to watch again! WHY IS THIS NOT AIRING!?!!?! I’ve watched it every year since I was very young!! Watching this movie with my mom and sisters is one of my favorite christmas traditions. Please put it on air or make a DVD. PLEASE!!!!!! I think you can buy this on DVD on ebay and/or amazon. Doesn’t look like anyone’s airing it this year, yet again. Please put the Christmas List on TV this year. My daughters and I always enjoy watching it. Wouldn’t it be better to watch a large variety of movies instead of the same movie over and over? When that happens, I switch channels! There are certain traditions that never grow old for each family. Our young people need something that happens regularly, that gives them security. No wonder they go out to tried something new each day – they wind up coming home with the silly thoughts of the people that think love can be switched on and off depending on how a person looks or whether they’ve had their coffee in the morning. The people in this love story had principles – as the young boy had memories of a loving mother. Please give us back some solid stories that stand by the stuff. I love the old – “Miracle on 54th Street” – The old “Christmas Carol” – and the “The Christmas list” worked right in there too. By the way – You can bring back “The Cowboy and the Movie Star”. That too was a good one. It’s our favorite of all the Christmas movies! I love this movie and I so wish I could get it on DVD. It has not been on in many years but I still love it. Every year I look to see if someone is going to have it on TV but I am always so disappointed. LOVE this movie. Can anyone tell me when this movie views this year? Hi Cynthia, as of right now it is not scheduled to air this year (2014). A HUGE disappointment for many. Still hoping it gets put in the rotation during December. I’m so disappointed in the recently made movies. 1 out of 10 turns out to be silly- same old nonsense. Once in a while there is one that makes you wish things were really that way, but most of the time: Boy meets girl, major disappointment on either end, disappointment is dissolved, they get back together. Normally the star role is played by someone that overacts. Makes it really unbelievable. Give me someone who has more character, less superstar status. THE CHRISTMAS LIST!!!!! Have to agree with the newly made Christmas movies being nonsense. Seriously, how many more TV Christmas movies are they going to make based on Family Man, Groundhog Day, blah blah blah. Same old garbage recycled with a different script and different actors. love to see The Christmas List too!! fingers crossed it runs this year! Please fit The Christmas List into your 2014 line up. It’s such a cute feel-good movie. Putting it on DVD would be great too, the original uncut version they played on air in 1997. Thanks!! Can you please play the Christmas List this year? Obviously, I am not the only one asking. Christmas List is my favorite move my Mom and Me watched it every year since 1997 when it came out. My Mother passed away 4 years ago, and last year was the first year I did not see it and I very sad. so we could still watch it. I use a public computer so I can’t watch it on the computer. Please add The Christmas List to the 25 days of Christmas List. This movie is on DVD for $9.99. When will The Christmas List finally come to DVD? Pleeeeeeaaaase put this movie on DVD. ONE of my FAVORITES! Loved this movie. Have been hoping for years that I could purchase it. I LOVE this movie. Like all of you I am so disappointed it wasn’t on TV last year. According to a couple websites I searched in December of 2013, Disney purchased the rights to this movie. I sent an email to Disney Support.com and received the following response: “Thank you for contacting us. Unfortunately we cannot assist you with your inquiry. We suggest contacting Walt Disney Studios Home Entertainment directly at the following URL: http://www.disneystudioshelp.com/Contact_Us.html Your may also contact them by phone: 800-723-4763. Regards, Jermaine, Disney Online, http://disney.go.com” I haven’t heard anything more from them. Please add “The Christmas List” (1997) to the list. One of my favorite Christmas movies and it has been omitted the past 2 years. I really wanted to see this one this year, I look forward to it every year and didn’t see that it was on any time, I was disappointed. Wish it comes to DVD soon. The Christmas List is NOT on Amazon or even made on DVD other than those on ebay, etc… That were filmed off the TV. You CAN, however, sign up on Amazon to be notified when (if) it’s ever put on DVD. I suggest everyone do that so the producers/studio know there is a big demand! Is THAT why I see only DVDs of a movie that was made in 1997?! I’ve been on Amazon for a year to be notified, but I guess I’ll have to get one of those DVDs from eBay. Filmed off the TV doesn’t bother me. I am still very disappointed, though, that no one had it on TV this year. Seems they could have taken one of those other movies and shown it only 99 times instead of a hundred and put the Christmas List on once! Sheesh. I’m with you, Kacki! The new movies this year are all pretty bad, and the older ones they’re showing are not the best either! In fact, I’d say each year gets worse—-On ALL channels! Bad year. Anyway, I found my copy on eBay and its great. There’s another website too I believe I referenced the link earlier in this post. Look back through the thread or Google it! I’ve been on that waiting list for years. It never happens. I cannot believe NO ONE is showing the Christmas List this year!! NOOOOO WAAAAAAY!!!! Come on, people, show this movie this year! So many people love it! Dangit! I would also like to see this movie this Christmas on TV. It seems to me, that every time a movie is made for Christmas or any other time or season; if that movie is one that many people enjoy then it is given a title like a classic, and the TV industry stops showing it. They take advantage of the movie, and hold it back from viewing until the timing is right, and then they charge you a lot to buy it on DVD. There are so many new so called Christmas movies out there. But the classics (which they call them)are the best made. This has been one of my favorite Christmas movies since I first saw it. I still cry every single time Danny grabs Melody’s hand to smell the perfume a bit longer. I recorded the movie years ago on VHS, but – alas – I no longer have a VCR. Guess I’ll be hitting up the Goodwill store and/or garage sales. Such a shame to not have it on tv this holiday season. I sure do wish someone out there in TV land would be willing to air this year 2013. This is my favorite Christmas Show. I am so disappointed that it is not on any TV listing yet. It makes me mad that they are showing some movies 5 to 6 times during 1 week or even more for the month. I just bought this from eBay. However, I suspect it is a pirate as an advert for the next tv programme came up at the bottom of the screen. I love The Christmas List. Please find a time to play it for us in 2013! I’m going to check out eBay and directmediadvd.com for a DVD of this film. I like to watch it every year, it is such a feel good movie! This is one of many favorite Christmas movies I watch. Does anyone know when it will be playing on TV for the year 2013? I haven’t been able to find it on VHS DVD or on TV. I’m having withdrawal… I need my Christmas List fix!!!!! Lol. This is one of our favorite Christmas movies. I can’t find where it is going to be shown on TV this year. Sooooo disappointed! If anyone finds that it’s going to be televised, please post it on here. I just saw The Christmas List on DVD for sale on ebay! Please, please, pretty please release “The Christmas List” on DVD! Especially since, despite overwhelming support on multiple sites, you have not included it in this year’s line-up on any Network. I love this film and every year. If you aren’t going to run it, at least let me own it. please. This movie is fabulous! You can watch it on YouTube. Hopefully ABC Family will show it again this year. I wish they would bring this out on DVD. There are so many people that would love to have it. It use to be on tv almost every year but it’s becoming less and less frequent. This was a great movie. I hate to see if phased out. Pleeeeease release on DVD or at least play during the holiday season!!!! Will The Christmas list be coming on DVD, if so when. Is it going to be shown on Hallmark this year? I like this movie too and would to have the dvd. I really like this movie, too, and wish is would be put on a DVD soon. I love this movie. It is a heartwarming Christmas story and should be back on tv for viewers to enjoy. Should also be on DVD. I would definitely buy it! I want this to be shown on TV instead of Good or bad witches or other garbage !! Come on folks, let’s get back to real life. I really like this movie. I wish it would come to DVD.